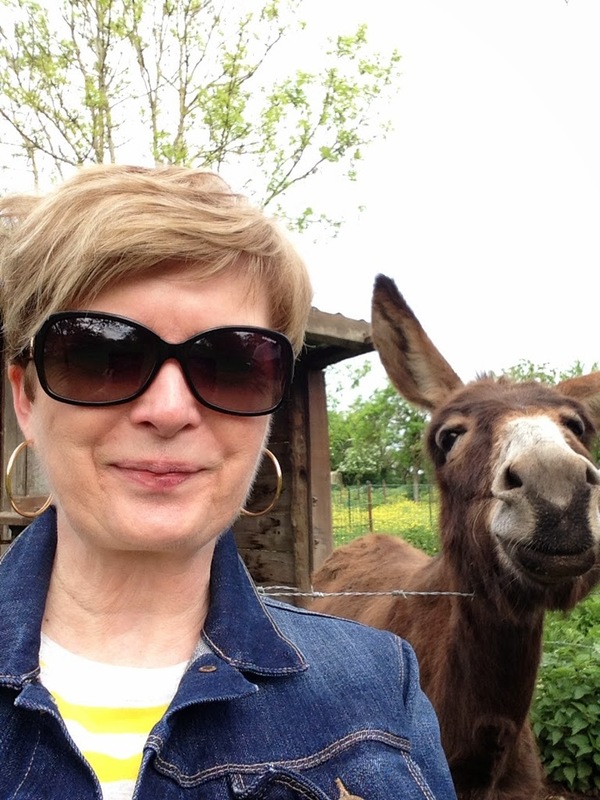 Our trip in France continues apace. Pace being the operative word. I think we bit off more than we could comfortably chew, in terms of how much ground we had hoped to cover in a month. Reminds me of when I was teaching and my very keen department and I used to jump into the deep end when it came to adopting new curriculum. 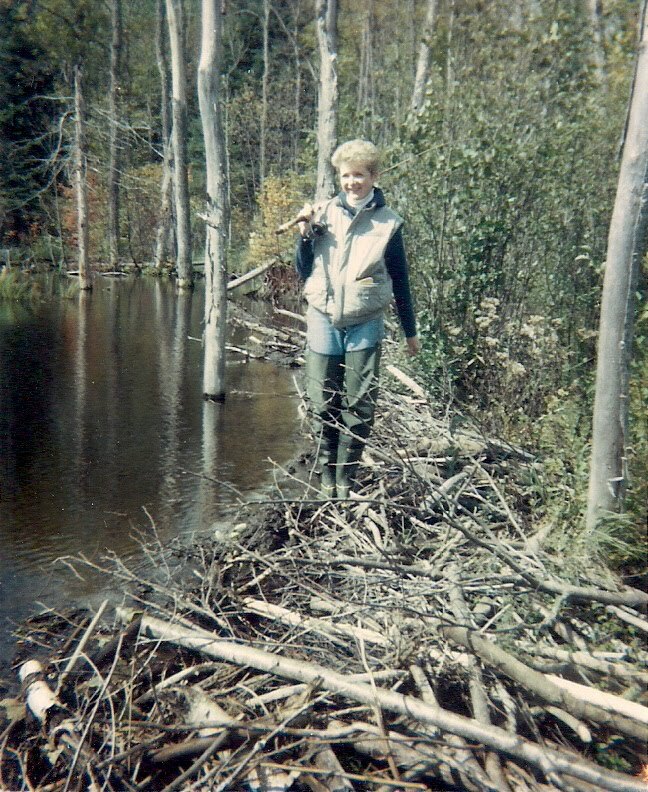 I can still hear my friend Nancy H. groaning, "How do we do this? We keep saying that we won't bite off more than we can chew. And yet here we go again...bite, bite, bite!" Yep. That's our trip in a nutshell, Nancy. Bite, bite, bite. Anyhoo. After six hectic days in Paris, we picked up our car and headed north. To Arras. A town almost completely destroyed in WWI and rebuilt to look almost exactly the same as it did pre-1914. The is the beautiful Place des Heroes. And the World War I battlefields. Pretty bucolic looking now. That is, until you realize that these are shell holes. 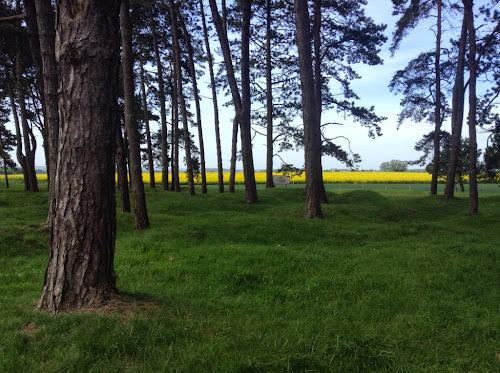 And, of course, the site of the Vimy Memorial. 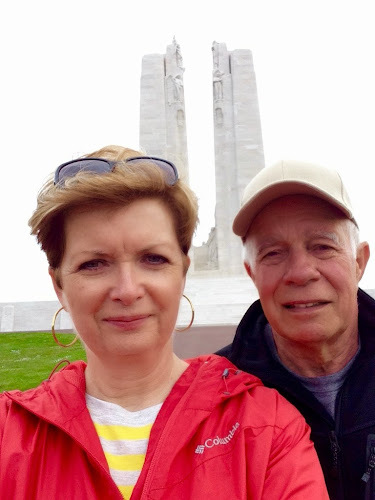 The battle at Vimy Ridge is an important part of Canadian history, and according to Hubby, considered by many to mark the birth of Canada as an independent nation. The first time that all the Canadian battalions fought together as one, under Canadian, not British, leadership. 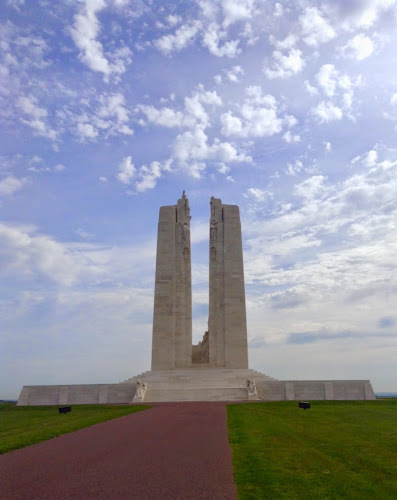 The Vimy Memorial is a stunningly beautiful monument. I first came to be interested in it years ago when I read Jane Urquahart's wonderful novel The Stone Carvers, which tells the story of the memorial, and the stories of the artists and carvers who created it. I taught for years at John McCrae Secondary School named after the World War I poet who wrote "In Flanders Fields," a poem which every Canadian school kid knows; at McCrae, our school ceremony on Remembrance Day was a major production. And for the last few years I taught, my writing class worked on the research and writing of the script. So all that, plus the fact that I love and taught a lot of WWI poetry and prose means I'm a bit obsessed with that era in history. Making this part of the trip a big deal for me. 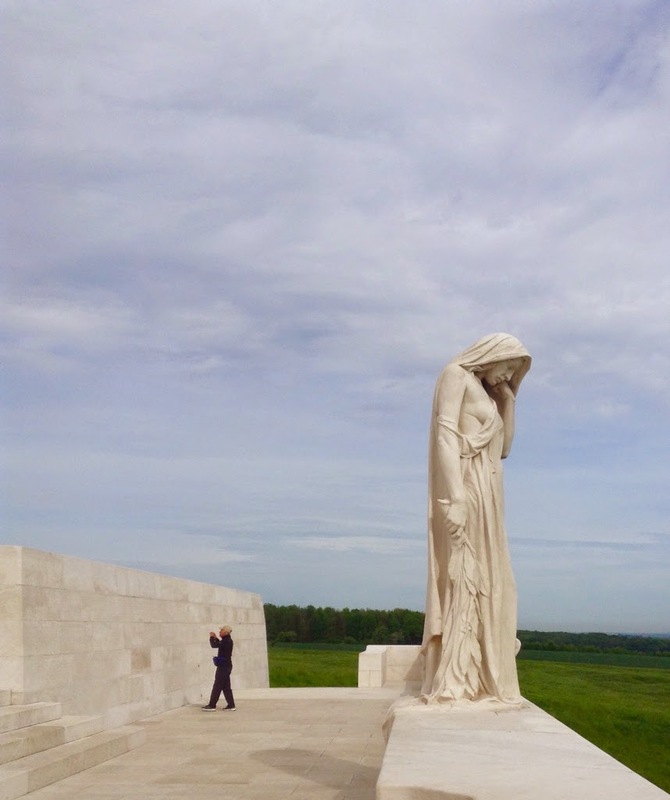 We had the Vimy monument site completely to ourselves that morning. Well, for a while anyway. Enough time to walk around, take pictures, read the name of Hubby's great uncle (or cousin, we're not sure) inscribed on the wall, listen to the quiet broken only by the sound of sheep in the neighbouring field. And just admire this beautiful structure. And feel proud to be Canadian. 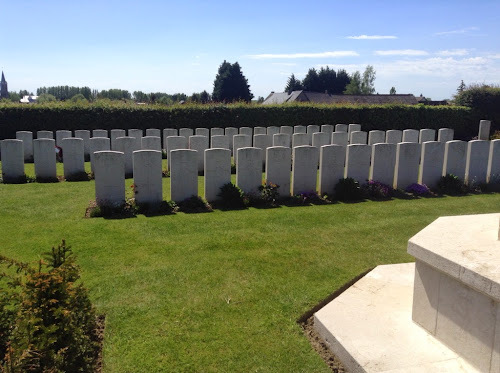 Then we visited some of the war cemetaries which dot the countryside. Whether this Canadian and British cemetary, near Vimy. 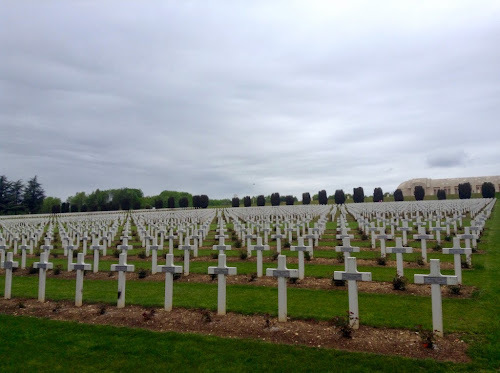 Or the French cemetery at the Douaumont Ossuaire near Verdun. They are all sobering to see. Not least of which is the newly opened "Ring of Memory" memorial at Notre-Dame-de-Lorrette, outside of Arras. 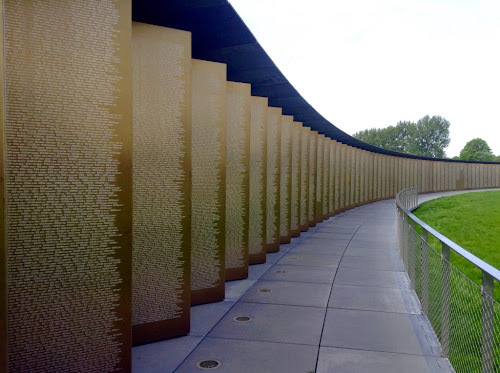 Literally a ring on which the 580,000 names of the soldiers of all nationalities who fell in northern France in World War I are inscribed alphabetically, not categorized by nationality or by regiment so as to focus entirely on the sacrifics of the individual. 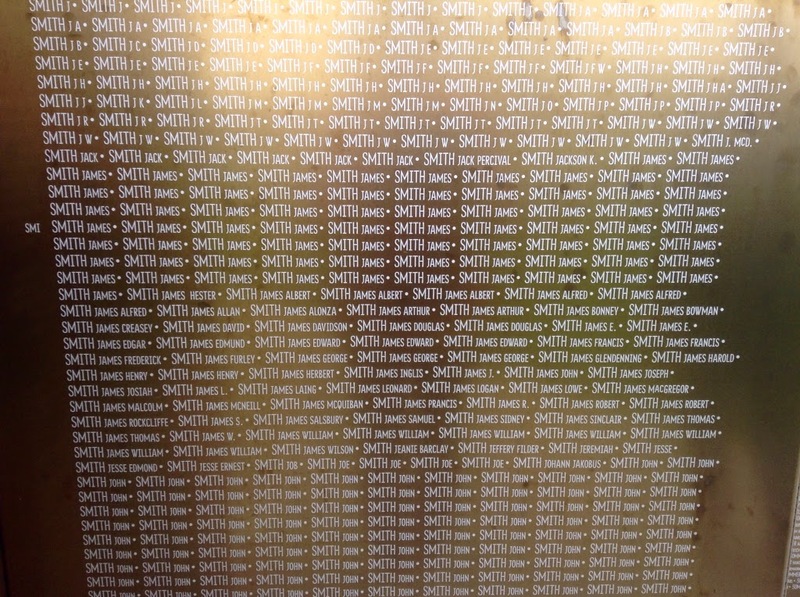 This is just a portion of the Smiths listed. 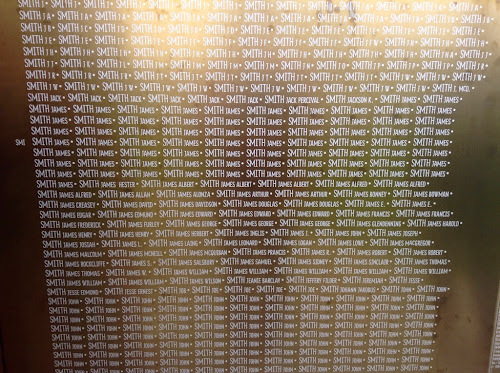 And there are just as many Schmidts, too. 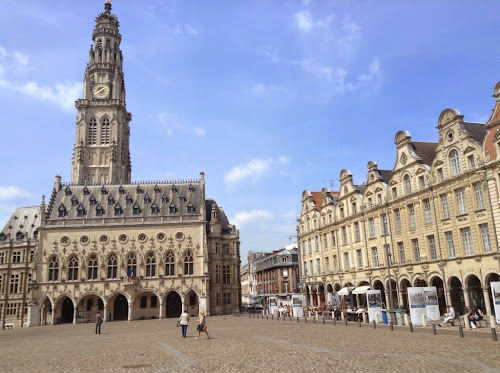 We stayed for three nights in Arras and two outside of Verdun. 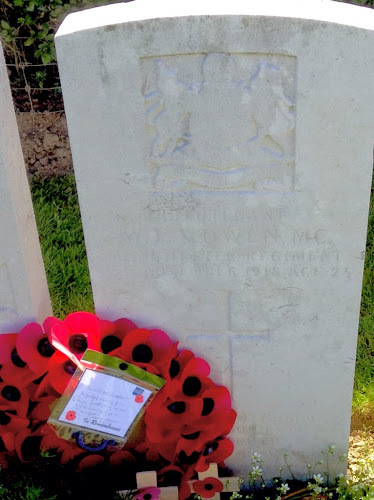 And the last morning before we left for parts south we set off on a very special pilgrimage... to find the grave of British poet Wilfred Owen. Owen was wounded in 1917 and sent home to recover from his physical as well as his psychological injuries. While recuperating, Owen met and was mentored by the older poet Sigfied Sassoon, and he went on to write his most powerful and famous anti-war poems. And even though he no longer believed "that old lie; dulce et decorum est pro patria mori"... that it is "sweet and fitting to die for one's country"... once recovered, Owen chose to return to the front to be with his men. And died there. Age 25. One week before the end of the war. His grave was not easy to find. 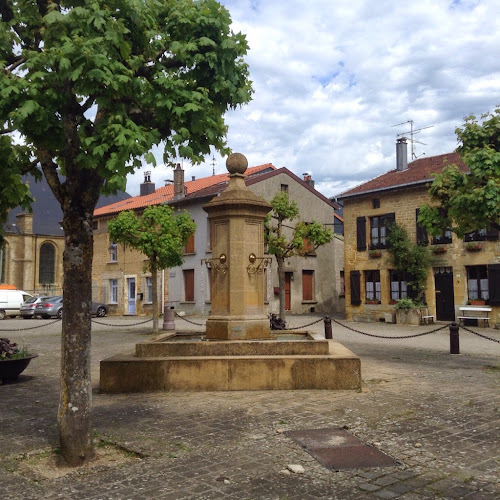 We circled around and through the tiny village of Ors. Missing the cemetary twice despite being given directions, "a la gauche" "train tracks" "droit, droit, et alors gauche," avec lots of hand gestures. Finally, we were there. 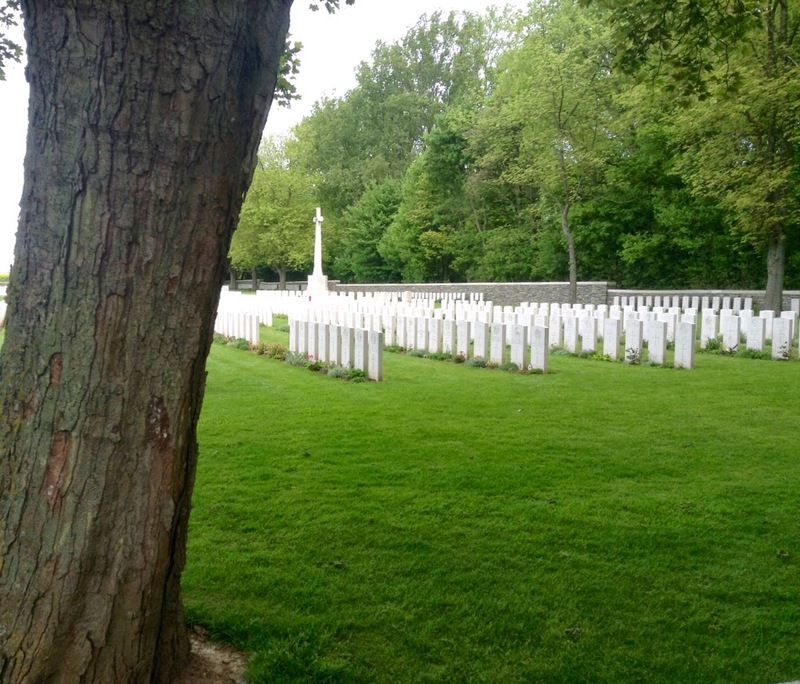 Ors Communal Cemetary contained the graves of the local village families, as well as three short rows of British war graves. The inscriptions on all the stones were pretty eroded. But, on Owen's, you can just makeout "W E S Owen. MC. Died November 4, 1918. Age 25. Someone had laid a wreath of poppies on which they had printed part of his poem "Dulce et Decorum Est" as well as their thanks. I must say I was grateful for Hubby's patience that morning. We spent well over an hour seeking and and not finding ...and we had a long drive still in front of us. But I am so glad that we eventually did find Owen's grave. It was important to me. Of course we saw lots of other sights in the days we spent in the north of France. Like wonderful countryside. Both around the battlefield areas. Saw beautiful old towns and villages. Like Montmedy, below. And made some surprising new friends. I must say that this was the first time I have been awakened in the morning to the sound of a donkey braying. And, you know, it was pretty cool. So after Verdun, we were headed for parts south. As another famous poet (kind of) said "we had miles to go before we could sleep." 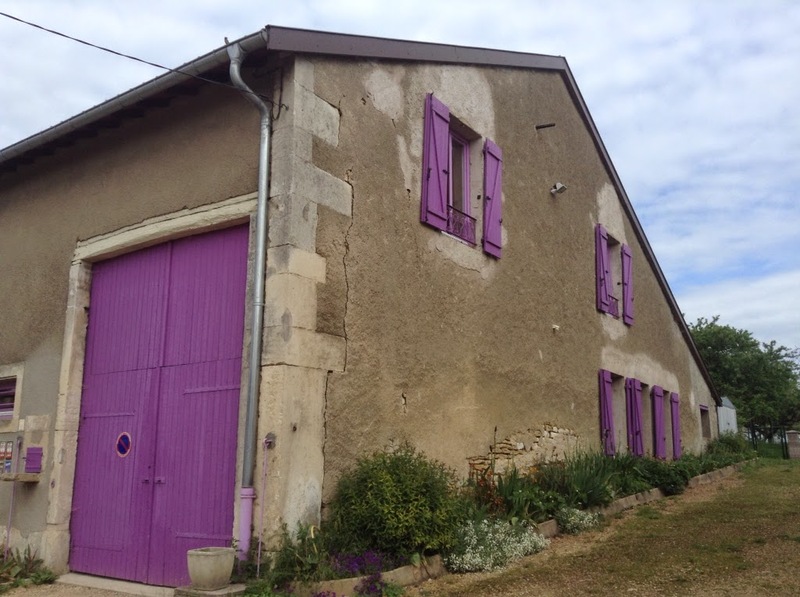 Tour de France landmarks to climb, wineries to visit, a bridge to dance upon. As I said... bite, bite, bite. But those stories are going to have to wait for another post. I think trips where you see "sights" can be a lot more tiring than ones where you simply wander neighborhoods. I hope that you enjoy the trip, even though it may be a bit more than you bargained for. xox. Very moving post and great pictures of both lovely towns and the lovely countryside. Thanks Diana. Pictures are not as good on Blogsy....so I appreciate the compliment. It looks like a wonderful journey. And especially so to find those landmarks with so much meaning for you. Yep...it's been amazing. I guess you leave on your own trip soon. Have a great time. 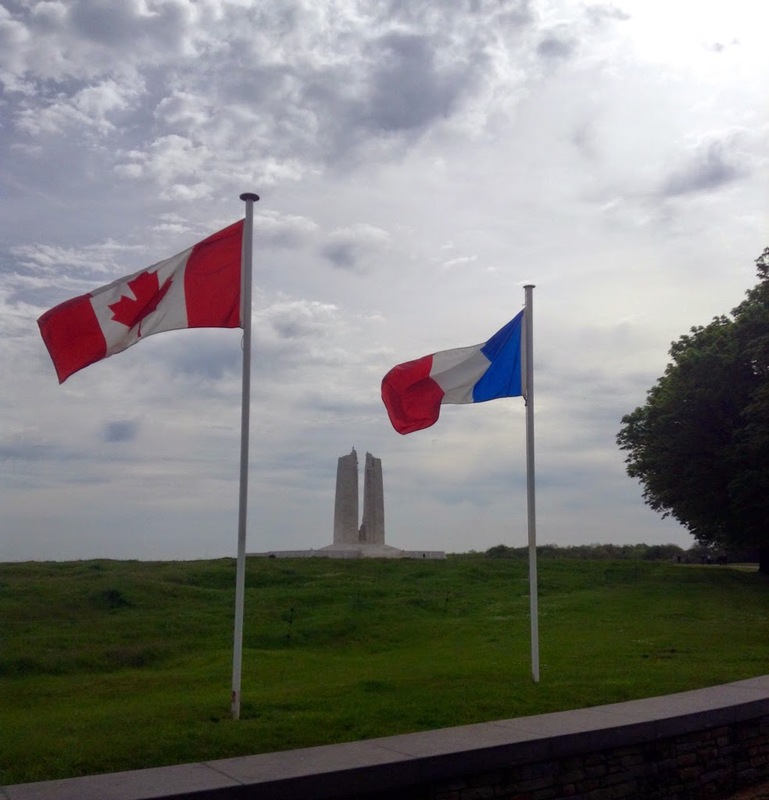 I was quite teary when we were at the Vimy monument in particular. I'll be tired by the time we get home, for sure. But, you're right...I won't have to go back to work. Sigh. It will be tea and a good book for at least a week! Oh wow...that's amazing. What a connection! I love Sassoon's work as well...so I will definitely look at that site. Thanks. 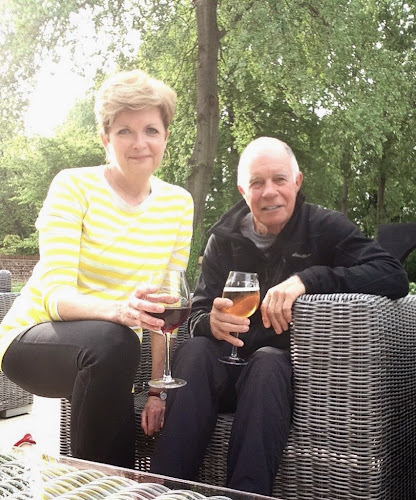 Really moving post Sue ... wonderful that you've been able to experience it all. Thank you for sharing it. I'm enjoying following your travels on Instagram as well. My sort of holiday, one that includes lots of travel and exploring new places that you've previously only read or dreamed about! I love the quote by St Augustine. "The world is a book and those that do not travel read only one page" . 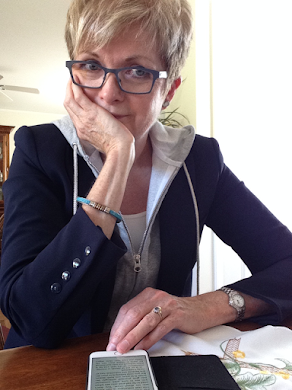 Reading your last paragraph ... did you dance on the bridge at Avignon!!? Have fun ... safe travels. Rosie. Thanks, Rosie. I love that quote..and the fact that you "got" the Pont d'Avignon reference! No dancing yet, though. The pace of your trip sounds typical Patterson style - Go til you drop. We too stayed in Arras, and could feel WW1 permeating the atmosphere everywhere. 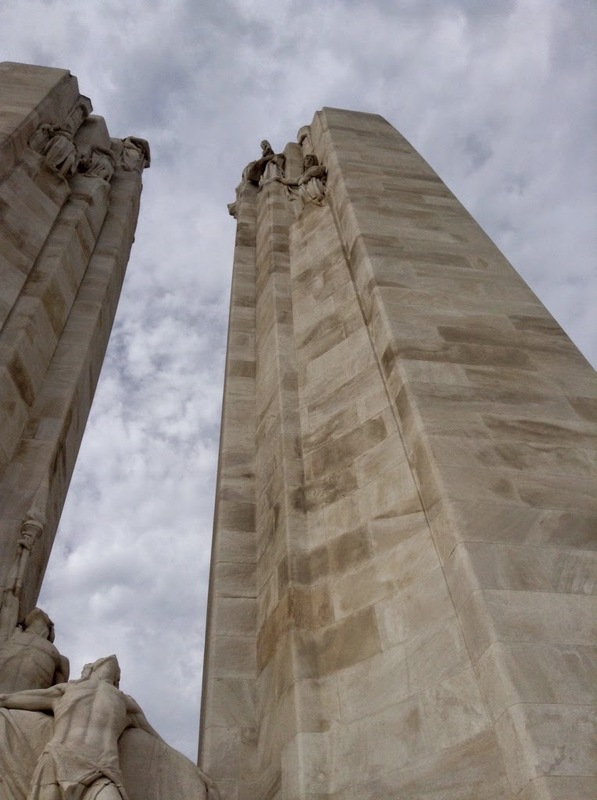 Luckily you could see Vimy Memorial. 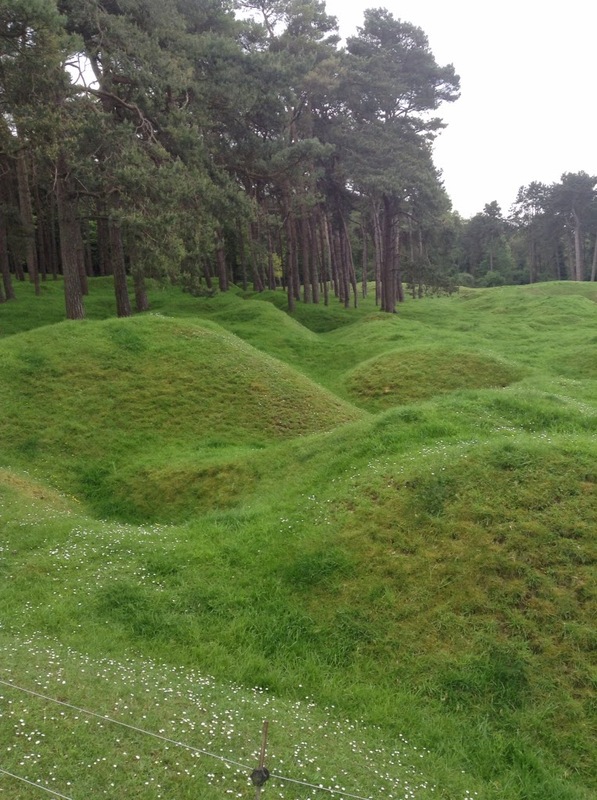 While we were there, rain bucketed down so hard we could barely see it - which made it easy to imagine the mud in all those trenches. Your pursuit of things poetical and so important to your heart is wonderful to read..
We loved Arras. The Flemish architecture was fabulous. Thanks so much for the compliment. I remember that you were the first person to tell me they were reading my blog. Beautiful post Sue. We wandered around many of the same areas a few years ago with Nora and Sebastian. Very moving. Thanks Jane. It was wonderful and emotional to be there. 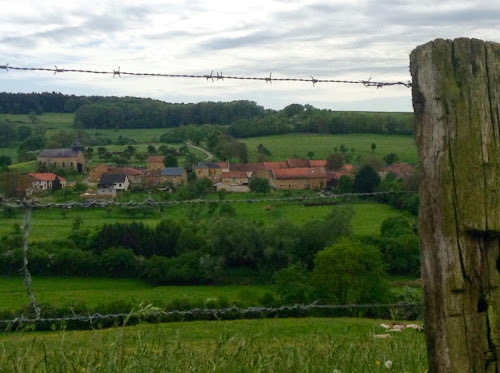 We toured France a few years ago and Husby, whose degrees are in history and who lived in France for a couple of years, trotted us through every historic site he could find. Loved it! We are going back in 2017 for the Vimy Centennial. So looking forward to it! Thank you for sharing your trip!